William Williams Pantycelyn (c. 11 February 1717 – 11 January 1791), also known as William Williams, William Pantycelyn, and Pantycelyn, is generally acknowledged as Wales's most famous hymn writer. As a writer of both poetry and prose, he is today considered one of the greatest literary figures of Wales. He was, however, equally distinguished in the world of religion, as one of the key leaders of the 18th century Welsh Methodist revival, along with Howell Harris and Daniel Rowland. Williams was born at Cefn-coed farm in the parish of Llanfair-ar-y-bryn, near the town of Llandovery (Llanymddyfri), in 1717, the son of John and Dorothy Williams. 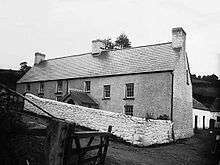 John died in 1742, and Dorothy subsequently moved to the nearby farm of Pantycelyn ("Holly Hollow"). The family were Nonconformists. William Williams was educated locally and than at a nonconformist academy near Talgarth. He had intended to become a doctor, but this changed in 1737/38, when he was converted under the preaching of the evangelical Methodist revivalist Howell Harris in Talgarth. For much of his life, Williams lived in the parish of Llanfair-ar-y-bryn, near the town of Llandovery (Llanymddyfri). 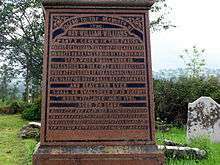 He died at Pantycelyn in January 1791, at the age of 74, and is buried in Llanfair-ar-y-bryn churchyard. He is also commemorated by a memorial chapel in Llandovery. William Williams felt called to the priesthood; and in 1740, despite his family's links with the Nonconformist branch of Christianity, he took deacon's orders in the Established church, the Anglican Church. Since disestablishment in 1920, the Anglican church in Wales has been known as the Church in Wales. He first appointment was as curate to Theophilus Evans (1693–1767) in the parishes of Llanwrtyd, Llanfihangel Abergwesyn and Llanddewi Abergwesyn. Around this time he became involved in the Methodist movement and in June 1742 his disapproving parishioners reported his activities to the Archdeacon's Court, in Brecon. Methodism was originally a reformist faction within the Church of England and was not intended to be a separatist movement or Church. It was nevertheless seen as a threat to the Anglican establishment and in 1743, when Williams duly applied for ordination as a priest, his application was refused because of his Methodist connexion. His choice was between a comfortable but conformist career in the Anglican Church or the economically precarious but perhaps spiritually rich life of a Methodist preacher outside of the Church. He would devote his life to Methodism. The key years in the foundation of English Methodism were between 1739, when the brothers Charles and John Wesley, both themselves Anglican priests, broke with the Moravian church and set up their own first chapel in Bristol, and 1743, when they drew up their General Rules. This was, unfortunately, the very time that Williams was beginning his own career in the Church and explains the hostility he experienced both from his congregation and from the hierarchy. Williams paid a higher price for his beliefs than did the Wesleys. Williams was shut out of the Establishment at the start of his career, whilst the Wesleys had already been ordained. Welsh Methodism predates 1739 and can be traced back to the conversions of the two main leaders of the Welsh Methodists, Howell Harris and Daniel Rowland, in 1735. It was an indigenous, parallel movement to its sister movement in England, and the Welsh Methodists were mainly Calvinists, who worked much closer with George Whitefield than they did with John Wesley. Charles Wesley declared that his own Methodism was not incompatible with his Anglicanism, and he was buried as an Anglican. John Wesley's doctrine was more favourable to Arminianism than to Calvinism. The brothers wished to reform some practices within Anglicanism, but were not seeking to take their faction toward a full Protestant Reformation. In Wales, however, most Methodist followed Calvinist teaching, and this led to great tensions between the Welsh Calvinistic Methodists and the Wesleyan Methodists, especially after the Wesleyan Methodists began actively evangelising in Welsh-speaking Wales from 1800 onward. In 1811, the Welsh Calvinist Methodists, who are now usually called the Presbyterian Church of Wales, seceded from the Anglican Church when they ordained their own ministers. Had he lived a little longer, Williams Pantycelyn would no doubt have approved these moves because, as a Methodist, he himself became a firm advocate of Calvinist Reformation doctrine and frequently invoked stern warnings against Arminianism, Arianism, Socinianism, Sandemanianism and other teachings. [See: G.T. Hughes: p. 7]. Williams Pantycelyn travelled throughout Wales (He is said to have partially supported his ministry by selling tea on his travels ) preaching the doctrine of Calvinist Methodism. He needed to be not only a theologian and an advocate for the new Connexion, but also an organiser and administrator. His converts gathered together in seiadau (fellowship meetings). Williams had to organise, and then maintain, these seiadau (fellowship meetings) as he went around the country. Each successful visit to a new locality in turn required a new seiat. Although he was not alone in his mission, the workload and mental burden must have been considerable. By the same token, it must have been deeply rewarding to see the community grow and thrive over the years and to reflect on the alternative life he had forsaken, as the priest of some obscure rural Anglican parish in mid-Wales. 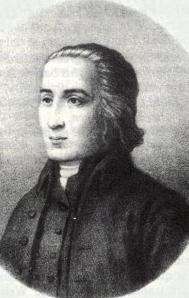 Together with Howell Harris and Daniel Rowland, William Williams "Pantycelyn" is acknowledged as a leader of the Methodist Revival in Wales in the 18th century. William Williams Pantycelyn was not merely an important figure in the religious life in Wales: he was also one of the most important influences on Welsh language culture, not just in his own lifetime, but on into the 19th and 20th centuries. He is particularly known as a hymnist. Williams' virtuosity as a hymn-writer earned him the accolade: Y pêr ganiedydd (The Sweet Songster). William Williams is often referred to simply as Pantycelyn after the name of his farm. Pant-y-celyn = 'Holly Hollow'. He wrote some of his work in English, but the great majority is in his native Welsh. He published his first work in 1744: this was the first part of Aleluia, a collection of hymns in Welsh. 1751: Hosanna i Fab Dafydd (Hosannah to the Son of David). 1759: Rhai hymnau a chaniadau duwiol (Some hymns and divine songs). 1762: Caniadau y rhai sydd ar y môr o wydr (The songs of those on the crystal sea). 1763: Ffarwel weledig, groesaw anweledig bethau (Farewell seen, and welcome unseen things). 1774: Ychydig hymnau (A few hymns). 1782: Rhai hymnau newyddion (Some new hymns). 1759: Hosannah to the son of David. Possibly his best known hymn is Arglwydd, arwain trwy'r anialwch (in English, Lord, lead thou through the wilderness). This has been adapted as the English-language hymn: Guide Me, O Thou Great Jehovah, or: Guide Me, O Thou Great Redeemer'. It is usually sung to the tune by John Hughes: Cwm Rhondda . 1756: Golwg ar deyrnas Crist (A view of Christ's kingdom). The history of salvation and God's grace in Christ. 1764: Bywyd a marwolaeth Theomemphus (Life and death of Theomemphus). The religious experience of conversion and Christian living. He also wrote a series of elegies in memory of various Methodist and other Christian leaders, including: Griffith Jones of Llanddowror, Howel Davies (the Pembrokeshire preacher), George Whitefield, and Daniel Rowland. Williams wrote original prose works and also translated others from English. Most were intended to assist the members of the Methodist fellowships he established. 1763: Atteb Philo-Evangelius i Martha Philopur (Philo-Evangelius's reply to Martha Philopur). These works were intended to defend and teach the significance of the 1762 revival at Llangeitho. The 1762 revival was a very powerful one which manifested its power physically. As a result, Methodists in Wales were very often known as Jumpers. 1777: Drws y society profiad (A gateway to the experience meeting). These were for the converts who were members of the seiadau or societies. 1762: Pantheologia, Neu Hanes Holl Grefyddau'r Byd (Pantheologia, or a History of all the World's Religions). 1767: Crocodil Afon yr Aifft (Crocodile of the River of Egypt). 1768: Hanes Bywyd a Marwolaeth Tri Wyr o Sodom a'r Aifft (A history of the life and death of three men of Sodom and Egypt). ↑ Phil Carradice (16 March 2012). "William Williams, Pantycelyn". BBC Blogs - Wales. Retrieved 21 November 2016. Hughes, Glyn Tegai (1983), Williams Pantycelyn. Writers of Wales series. Cardiff : University of Wales Press on behalf of the Welsh Arts Council. In English. Roberts, Gomer Morgan (1949,1958), Y pêr ganiedydd : Pantycelyn. 2 vols. Aberystwyth : Gwasg Aberystwyth. In Welsh. 'Williams, William (1717–1791)'. In Meic Stephens (ed.) (1998), The new companion to the literature of Wales. Cardiff : University of Wales Press. ISBN 0-7083-1383-3. E. Wyn James, ‘The Longing and the Legacy: Liturgy and Life in the Hymns of William Williams of Pantycelyn’, The Bulletin of the Hymn Society of Great Britain and Ireland, No. 286, Vol. 21:5 (Winter 2016), 163-78. Williams Pantycelyn at the National Library of Wales. Gives access to a digital version of a manuscript in Williams's hand, NLW MS 77A.